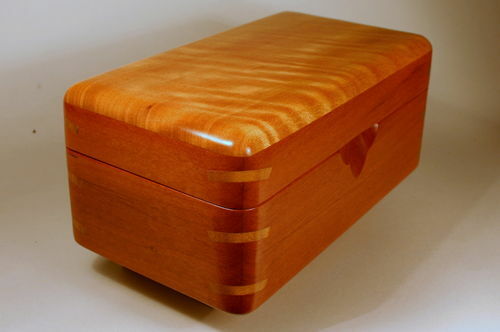 I’m planning to make some keepsake boxes as presents. I decided that if I was going to make some boxes I’d better learn how to make them before I needed the skills and screwed up some expensive piece of wood. I downloaded some plans then made some jigs I’d need. Here’s my first attempt. This box is made from some scrap wood in my shop. The body of the box is cedar from a fence project and the top is a piece of cherry from an old table I refurbished. I certainly learned a few things along the way. A few more practice boxes and I should be ready to make some for real. Great looking box, and a big welcome to lumber jocks. I would like to see more details about how you made the box. Pictures! I am trying to learn more box making techniques. 49er there’s complete instructions for this type of box on finewoodworking.com. Chris, This is a great start. It looks like you have mastered lots of basic techniques and methods. Your spline jig is working well. Welcome to Lumberland. If you want more tips you might try looking at the index below. The tips are arranged by topic. You might benefit from the tutorials on rounding and strap clamps. Tutorials: For methods used to make boxes like the one pictured above just click on the blue links below. They are arranged by topic. Installing an attached top: like that pictured above. Very nicely done. Looks like you’ve got the box-making down pat.